It’s the time of the year that we all love, when we pack our lightest clothes and our sunglasses (Read: ‘EYEccessorize’), and head to a warm destination that usually includes a pool or a beach. But as the summer is slowly approaching, we need to start thinking of how important it is to be safe around water. And when it comes to children, babies or toddlers, things get more serious – a baby or a toddler can drown in depths of less than one inch, and this is something that we need to constantly keep in mind and never leave him unattended close to water of any depth, as it can be extremely dangerous. 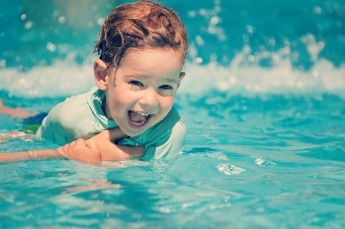 So be prepared and make sure you and your little one are properly equipped for a summer full of fun but also away from the dangers of the water. Even before your holidays, think about all the important things around water safety at home. Never leave your baby unattended in the bath, near a pond in the garden or even buckets filled with water close to him. Be mindful at all times and ensure your entire home is safe for your baby. In order to get started with some basic information on how to keep babies and children safe around water, you can take a look at a number of online resources that are available to parents such as water safety at home, by the Safe Kids Worldwide organisation. Also check out their very useful water safety check list. Cold Shock Response lasts for only about a minute and refers to the effect that cold water has on your breathing. It is a lot more complicated and dangerous than just gasping for air. It can happen when someone enters cold water so be mindful and check the water temperature before letting your child go in. Jumping into cold water, even on a sunny day, can affect your ability to swim and run the risk of drowning. It’s also important to never underestimate hypothermia as well, as body temperature drops more quickly in water than on land; make sure you always enter the water slowly and that it feels comfortable for you and your child, and especially your baby. 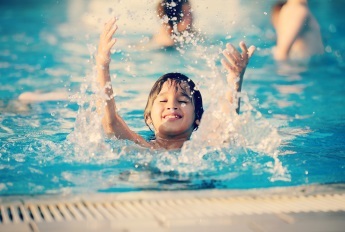 Where the water depth is clearly marked, such as in pools and water parks, you have better control over which water levels your child is comfortable swimming in. However, in lakes, ponds and sea the water depth is mostly unknown and/or uneven in places. [quote_box_right]While all the information around water safety can sound scary, always remember that if you are well prepared and confident you can have fun with your family and be safe at the same time which is what we all want during our holidays[/quote_box_right].According to the The Royal Life Saving Society around 85% of accidental drownings occur at open water sites. Be extra cautious around open water and make sure you don’t let your little one go into unknown water depths. It is always a good idea to invest in a good quality swim vest and have your child wear it whenever he is near water, especially if he is just learning how to swim. However, remember that a swim vest or jacket should never replace the grown up who is looking after the child and you should never leave him unattended near water. Accidents in water can be prevented with good knowledge and understanding of open water safety. It is important that you know what to do when an emergency occurs. Being prepared also helps you feel more confident to assist a person who may need help. The British Red Cross offers a range of first aid courses for parents who want to know what to do in case of an emergency. You can physically attend those courses if they are near you or you can download the British Red Cross Baby and Child First Aid app for more information and first aid support. You may also consider enrolling yourself and your family in swimming lessons that will prepare you well during the year for your summer holidays. Not only it is an excellent way to develop your swimming skills, it is a good exercise too. Plus, it’s fun for everyone! If you would like an extra safety net, you can always choose swimming pools and coasts with a lifeguard. However, even when there is a professional lifeguard available, you should never leave your child unsupervised and if there is an adult who is supervising your child while you are away make sure he is familiar with the dangers and that they are prepared to step in in the case of an emergency. Lastly don’t forget to drink lots of water and sit in the shade – try to avoid exposure to the sun between 11 am and 3 pm and to rest for at least half an hour after eating and before going into the water, (Read: ‘Your Body, Your Bikini’). What other precautions are you taking during your holiday near water? Let us know in the comments below. Filian is a Greek-born, UK-residing freelance writer. As a mom of twin toddlers, she is surprised every time she finds time to indulge on her favorite hobby: meditation. Filian absolutely loves food and healthy eating, and grows her own vegetables at home.